A chafing dish is a kind of portable grate raised on a tripod, originally heated with charcoal in a brazier, and used for foods that require gentle cooking, away from the "fierce" heat of direct flames. 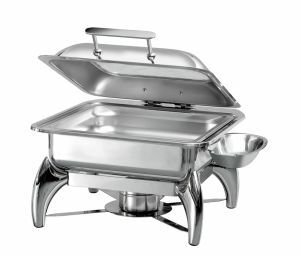 The chafing dish could be used at table or provided with a cover for keeping food warm on a buffet. Double dishes that provide a protective water jacket are known as bains-marie and help keep delicate foods, such as fish, warm while preventing overcooking. Bain marie,which run off electricity, chafing dishes use jelly fuel as a heat source. Depending on the style of the establishment, very elaborate and decorative units for buffet setups are available.